Residents of the northern border town of Rajar (Ghajar) are stranded, unable to get back to their homes due to the Hezbollah attack. Dozens of residents of the northern border town of Rajar (Ghajar) are stranded, unable to get back to their homes due to the Hezbollah attack on IDF forces earlier Wednesday. Two Israeli soldiers were killed when Hezbollah terrorists fired on IDF vehicles in the Har Dov area. The town of Rajar, which straddles the border between Israel, Syria, and Lebanon, is very close to the area where the terrorists attacked the IDF vehicles, and entire area has been closed off by the IDF. While residents have been permitted to come up out of bomb shelters, they have been instructed to remain close to them. Meanwhile, residents who were out at work or on errands came home to find the approaches to the village blocked. 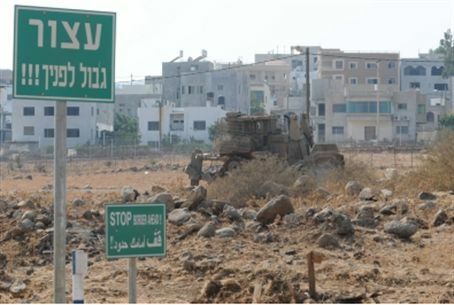 The IDF said that it was planning to bring the residents home as soon as it was safe. Meanwhile, the stranded residents are the guests of the army, and are being taken care of by IDF personnel, the army said. Residents said that they heard an explosion “very close” to the village. Immediately children in the village school were guided to a bomb shelter, where they remained for two and a half hours. Minutes later, the sound of gunfire was heard, apparently IDF retaliation for the Hezbollah bombing. Several mortar shells were fired near the village, and residents said that some cars and homes suffered light to moderate damage. Two IDF soldiers were killed earlier Wednesday when Lebanese terror group fired antitank missiles at two IDF vehicles in the Har Dov area (Shebaa Farms) in a Hezbollah ambush. Six casualties in light to moderate condition were taken to Ziv Hospital in Tzfat. Additional casualties were evacuated to Rambam Hospital. The IDF vigorously denied Hezbollah claims that an IDF soldier had been kidnapped, and a Lebanese report later confirmed that Hezbollah had failed to capture an Israeli soldier.